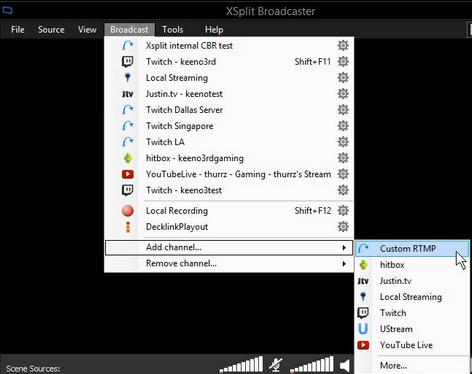 How to stream with xSplit Broadcaster. The first step you need to do is to input a video feed source by clicking the "Add" button from the bottom of xSplit window. Here you are able to select the capture card, webcam, or screen capture scene. 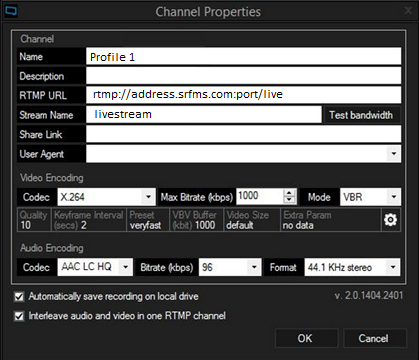 We can now create a custom RTMP channel in order to add your Primcast Video Streaming server details. Click on the "Broadcast" button on the main screen then access "Add channel -> Custom RTMP"
After you have selected "Custom RTMP" a new window will pop-up. Here you need to input your Primcast streaming details from your Dashboard. You can also access these details from the setup e-mail that you will receive after the account has been created. In the "Stream name" field input your desired stream name, the most commonly used name is "livestream". Select your encoding settings like audio/video bitrate and codec. Once you have completed the setup as guided above, hit the "OK" button to go back on the main screen, where you will find your fresh created streaming profile. Click on it to begin live-streaming with xSplit Broadcaster.